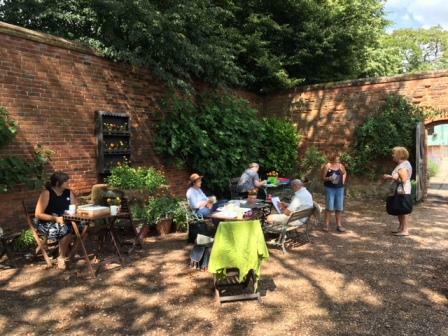 The photograph was taken at Castle Bromwich Hall Garden on 11th July, it shows members (those present were Jane, Jennifer and Colin) with some of the visitors who joined us for ‘The Mid-Week Draw’. A relaxed drawing session on the second Wednesday of each month now in its second year. 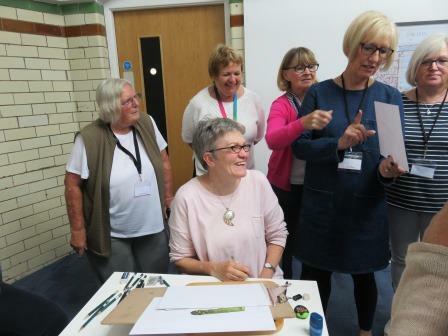 Some of our visitors have become regulars – we meet to draw and paint, chat, have a cup of tea with no pressure, no tuition just advice if requested as some are experienced artists but not botanical artists. The RHS Botanical Art Show was inspirational as usual. The ‘Association of British Botanical Artists’ (ABBA) had a promotional stand. ABBA was established in 2017 to gather together a body of work from British artists for the 2018 world wide day of botanical art. The organisation would like to continue and were asking people to express interest by filling in a form. This form is also available on line at www.britishbotanicalartists.com Currently they are finding out how much interest there is filling in and sending the form does not commit you. There will not be any selection process for membership which is expected to cost £45/annum. ABBA is aimed at linking people to native plants through botanical art and they hope to hold workshops and exhibitions. On 14th June a group of eleven society members met in London to see two exhibitions of art by Cedric Morris. Starting at the Philip Mould Gallery, on Pall Mall, to see the exhibition ‘Beyond the Garden Wall’ this featured paintings of his travels mainly around the Mediterranean, Mexico and England, we also met Philip Mould. Following lunch we travelled by taxi to The Garden Museum, to see the exhibition ‘Artist Plantsman’ which featured his plant portraits. Into taxis again to our restaurant before making our different ways home. Many thanks to Jane Edwards who organised the day. 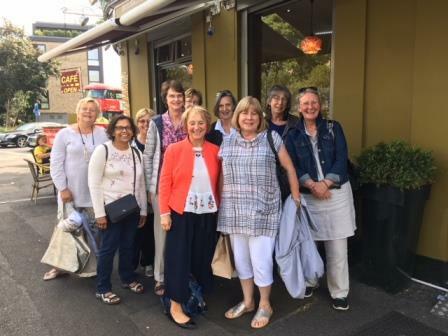 Susan Christopher-Coulson came to our meeting on 17th June and gave us a fantastic workshop. For all and particularly those not familiar with working with coloured pencil the information that she passed on about the types of pencils and paper she uses and the practical help she gave was first class. Cedric Morris – two complementary exhibitions. Philip Mould Gallery, Pall Mall and The Garden Museum, Lambeth Palace Road. Both exhibitions are on until 22nd July. Kew Gardens, Shirley Sherwood Gallery until 16th September. The Florilegium – An exhibition of works illustrating the beauty and diversity of plants grown by the Royal Botanic Gardens, Sydney. Also Works from the Shirley Sherwood Collection of native Australian and New Zealand plants. Our society exhibition in Solihull was a success. We had many favourable comments especially on the high standard of work, congratulations to all who participated. May 18th is Worldwide Day of Botanical Art. The Association of British Botanical Artists has organised an exhibition at The Peter Scott Gallery, University of Lancaster which is from 18th May to 8th June. More details on their website but if you cannot get to the exhibition you can obtain the catalogue through the web site it has images of all the paintings. Thank you to Julia Trickey for the workshop on 15th April about ‘Composition’. as well as those attending the workshop other members were working on their own projects in another room.